At Golden Tea Leaf Co. we strive to craft fragrant teas that are naturally grown, sustainably produced, hand harvested and small batch processed using proprietary methods to bring out the unique flavors, and to introduce North American tea drinkers onto new varietals. "Tea is just a plant. It’s the proprietary roasting techniques, the environment and the quality of care that goes into growing and harvesting the plant that matters. One sip, is to love them." As consumers increasingly become connoisseurs of high-quality products and educated on health and wellness, tea has stepped further into the spotlight (it is the second most consumed beverage in the world after water) creating a demand for innovation, imagination and accountability. Entrepreneur Peggy Lee of Vancouver-based Golden Tea Leaf Co., is striving to further advance the North American tea industry by introducing a line of innovative, exclusive, top quality, single estate, single origin whole leaf teas. The teas are not sourced, but created by the Golden Tea Leaf Co. in partnership with a single farm in the mountains of Taiwan. Owner and chief innovator Peggy Lee, is striving to hook North American tea drinkers onto new tea varietals and flavours, to demystify them and ensure their appeal and accessibility to the North American market. The teas are available through the online retail store at http://www.goldentleaf.com , http://www.amazon.com, and selected retailers. There is nothing typical about oolong tea nor is it commonly consumed in the Western world but, when it comes to tea, oolong offers the greatest diversity of flavour, complexity and body, with Taiwan currently considered its most noteworthy producer. The Charcoal Roasted Jade Oolong is an original tea created and only available from the Golden Tea Leaf Co. It has been roasted over a low charcoal heat repeatedly to create a distinctly fragrant tea. The liquor is a beautiful light amber, with a milky sweetness, easy on the palate and stomach. It stores well, impervious to heat and oxidation. 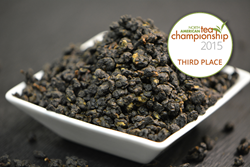 This tea won First Place Winner at 2015 North American Tea Championship in the most prestigious category, “loose tea.” Ali Mountain Oolong, grown 1000m above sea level on the mountains in Taiwan, is hand harvested, processed, and crafted. It features a delicate yet robust floral note leaving behind a sweet and smooth aftertaste. This tea brews to a beautiful golden liquor colour, and can be infused over five times. This is a tea that a seasoned tea connoisseur as well as a beginner tea drinker can appreciate. Pioneered by Golden Tea Leaf Co., the Pine oolong tea is a semi-oxidized delicate green oolong tea that brews to a light honey color with a slightly floral sweet fragrance which lingers after the last sip. It is highly unique for its hot or cold brewing options which makes it convenient, and perfect, for all seasons. Easier on the stomach, green tea fans will quickly convert to this tea after the first cup. This unique fully oxidized “bug bitten” black tea is rarely found outside of Taiwan. It is often likened to the Oriental Beauty, a very expensive and limited production oolong. A kilo of authentic Champion grade Oriental Beauty sells for $8,000 – but finding any to purchase is also rare. The “bug bitten” Honey Red Jade tea is grown naturally to encourage tea leafhoppers to feed on the leaves which creates an enzyme reaction that produces the natural honey fragrance and taste. This tea brews to a dark caramel color with a sweet fragrance and refreshing taste. Honey Red Jade tea is irresistible when hot but even better when it has cooled. The unique sweet floral and honey fragrance becomes more pronounced and a hint of citrus emerges. This tea can be left in a cup or tumbler without concern for over steeping, going cold or becoming bitter. Golden Tea Leaf Co. has created the Honey Red Jade as an everyday convenient luxury tea. Each of Golden Tea Leaf Co.’s silk bags contain three grams of whole leaf tea, which is above the industry standard and allows for multiple brews. One sachet will last the entire day by adding more water to the cup as it steeps and the leaves bloom, but will never gain a bitter taste. Each box contains individual foil wrapped sachets featuring pyramid shaped silk bags. Prices for the boxed tea sachets start at $11.99. Golden Tea Leaf Co. offers black, green, oolong and Pu erh teas in amounts ranging from 50g to 100g or more and available in tea sachets or loose tea options. Teas are available through the online retail store at http://www.goldentleaf.com and other retailers. According to Canadian Food Trend to 2020, a report commissioned by Agriculture and Agri-Food Canada, tea consumption is expected to jump 40 per cent by 2020. Canadians current drink over 10 billion cups of tea per year while Americans consume well over 80 billion. The US tea industry anticipates strong, continuous growth of hot tea driven by convenience, interest in the health benefits of tea, continued innovation and the discovery of unique, flavorful and high-end specialty tea. About Golden Tea Leaf Co.
Golden Tea Leaf Co. is made up of a group of tea enthusiasts with a passion for affordable high quality, single estate, single origin whole leaf tea presented in convenient silk sachets for easy brewing. The teas are hand harvested and small batch processed to bring out the unique flavors. Using proprietary processing methods, the company strives to craft rare and fragrant teas naturally grown and sustainably produced from a single farm in the pristine mountains of Taiwan.